A public sculpture by Vito DeBari is among the amenities at the Corkscrew along the Northbank Riverbank under the Acosta Bridge. The Corkscrew is an outdoor gym along the Northbank Riverwalk under the Acosta Bridge. If you haven’t walked the Northbank Riverwalk for a few months you’ll find something new under the pedestrian bridge by the railroad tracks under the Acosta Bridge. 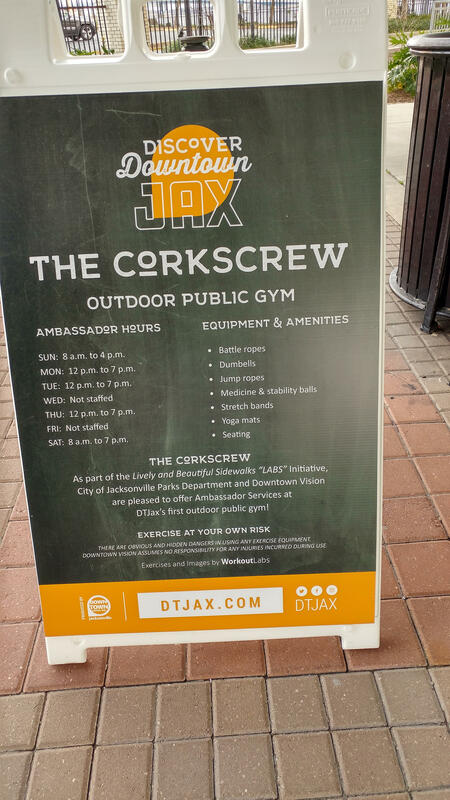 It’s called the Corkscrew and is being billed as Jacksonville’s first outdoor gym. It’s a collaboration between the city and the nonprofit Downtown Vision. District 5 City Councilwoman Lori Boyer told WJCT News the Parks and Recreation Department has been working on getting the project off the drawing board for several years. “I think it's turned out very nice and seems to be very well received and heavily used,” Boyer said. The Corkscrew features workout equipment and amenities including free weights, yoga mats, jump ropes and medicine balls. A sculpture combines art and exercise by including pull-up bars and exercise rings. Artist Vito DeBari did a similar outdoor gym project in Miami called MyEquilibria – the Wellness Park. And this isn’t a “set it and forget it” project. Downtown Vision is keeping a close eye on things thanks to its Downtown Ambassadors program. An ambassador is assigned to Corkscrew to make sure the equipment is well taken care of and locked away when the gym is closed. The ambassadors can also help guests with questions about Corkscrew or the area. “Year over year our ambassador program has gone up from 12 to 18 employees,” most of them full time, said Downtown Vision’s Katherine Hardwick. Hardwick also credits the ambassadors program with making residents and tourists feel more comfortable in the area. “One of the things we know from studying other downtowns and city centers is that well there will always be folks maybe who are panhandling. That is usually offset by having just a wealth of people enjoying the space, so it's not as noticeable, and that's one of the reasons that we bring in the ambassadors to act as that hospitality service. The ambassadors know a lot of the folks who are passing through and they've met them, they've talked to them so they can be that comforting force for folks," said Hardwick. New artificial turf and landscaping has been added to the space, and bathroom facilities that were already onsite have been freshened. A list of the hours and amenities at the Corkscrew. Boyer said the new landscaping may end serving as a “landscape palette” to improve other parts of the Northbank and Southbank Riverwalk. The city also recently completed its Sidney J. Gefen Riverwalk Park improvements. That’s the area of the Northbank Riverwalk in front of the Jessie Ball duPont Fund headquarters that includes a new walkway around the former footbridge and a kayak launch. The next two big projects will be Riverwalk improvements in front of the Times-Union Center for the Performing Arts on the Northbank and the Friendship Fountain area on the Southbank. “Those two spaces are the big projects that are funded and in design and in various stages right now of influence, which are going to be, take Corkscrew and multiply it. Those are both going to be very exciting spaces,” said Boyer. Jacksonville’s new Southbank Riverwalk opened to great fanfare today. The updated city park features a new fountain, artwork and lighting for evening strolls. Jacksonville City Councilman Don Redman was riding his bike down the newly paved Southbank Riverwalk this afternoon. Redman said it’s his first time back on his bike since going for a ride down the old wooden, Riverwalk in this same location. A handful of development projects in downtown Jacksonville were approved this week.